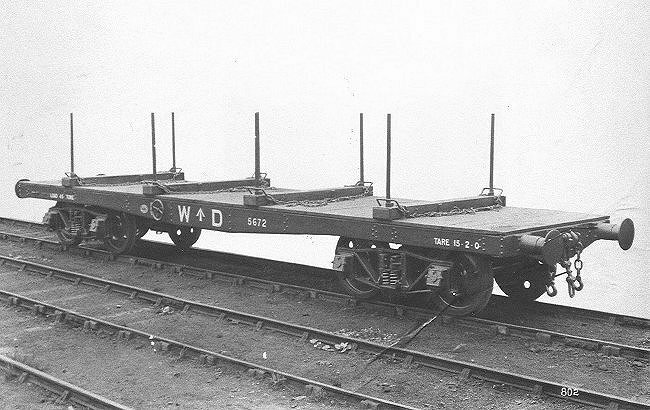 War Department Poll wagon WD 5672 had four bolsters when built. Manufactured by the Leeds Forge Co. 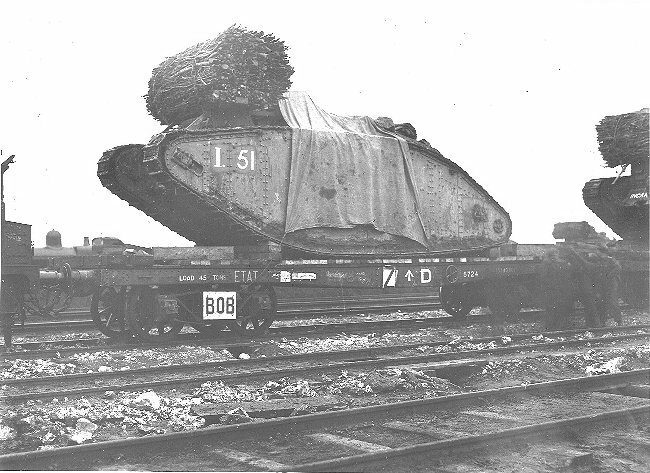 The Poll wagons were designed to carry 47 tons, but a letter from the War Office to the manufacturers of 7th October 1917 specified that the maximum load would be 45 tons. The bolsters were removable. The number series for these wagons was from WD 5663 to WD 5771. 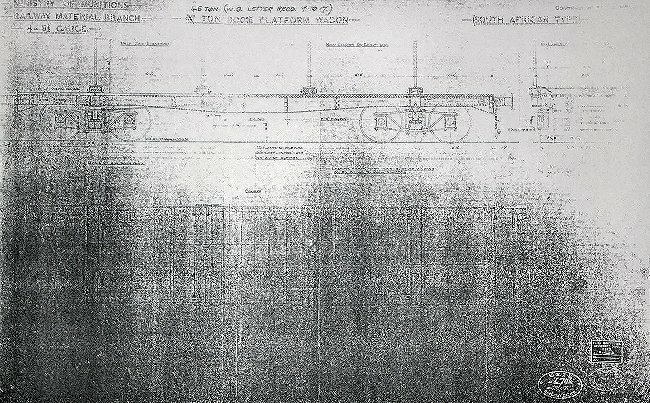 Diagram of the War Department Poll wagon. The reference on the drawing to "South African Type" has never been fully explained. 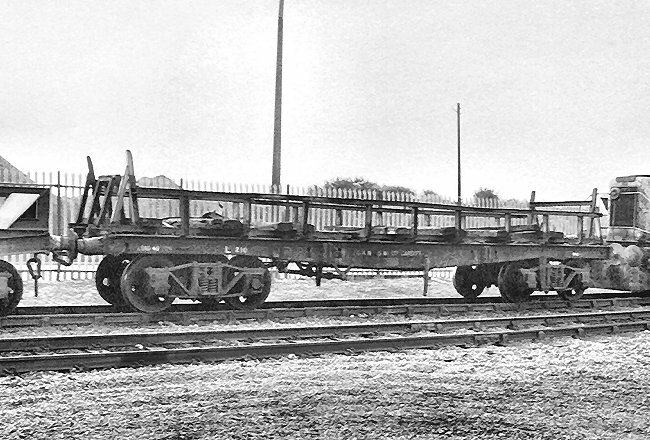 Most likely the pressed steel solebars and cross members were assembled using a jig that was originally created for the manufacture of similar wagons for South Africa. This photo was thought to show a rare surviving former WD Poll wagon in 1986 was L210 at Allied Steel & Wire in Cardiff. However, it is now suspected to be the chassis of a former Great Northern Railway brick wagon. Some of the Poll wagons were sold to the NER after hostilities ceased. It is possible that all of them went to the NER. This diagram shows Quad 4934. The tare weight of these wagons was 15-16. The maximum permissible load on the middle two bolsters was 10 tons. The minimum curve was 100 feet radius. In LNER days these wagons were numbered 139622 to 139671 plus various non-sequential numbers. 139639, 139642, 139644, 139648, 139649, 139650, 139651, 139654, 138656, 139657, 139658, 139659 and 139660. When the NER became part of the newly formed LNER, the Poll wagons became LNER property. This is LNER diagram 25051E of a Poll wagon in service to Zeebrugge via the Harwich - Zeebrugge train ferry. The wagon was sold to Great Eastern Train Ferries Ltd and later was re-purchased by the LNER. Notes on the drawing say the wagons were originally rated to carry a 45 ton load, but this was reduced to 43 tons at the request of the Continental authorities. The diagram gives the relevant LNER wagon numbers as 139638, 138640, 139641 and 139643. It is believed that one of these wagons continued in ferry service under BR ownership until circa 1970. War Department Poll wagon WD 5724 carrying tank I.51. War Department wagons working in France were placed under the control of the French State Railway ETAT. The meaning of the sign "BOB" is unknown. 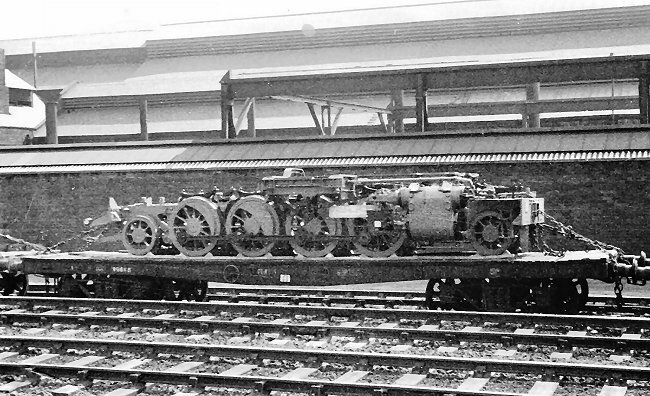 Former WD Poll wagon 39669 (or perhaps ex-LNER 139669) was photographed at Gorton on 2nd February 1953 carrying one of the two chassis units of a Rhodesian Railways Beyer-Garratt articulated 2-8-2 + 2-8-2 steam locomotive. This War Department Poll wagon diagram was produced by the SE&CR at Ashford Works in June 1919. The bogie wheelbase is 27' 0" and the length over headstocks is 40' 0". 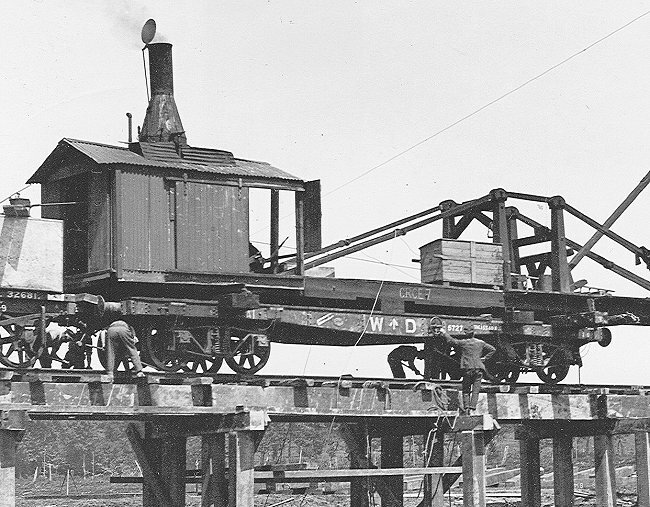 War Department Poll wagon WD 5727 fitted with steam driven pile driver CRCE7.